4-ingredient raspberry mango smoothie – so easy and amazingly refreshing! With our Cabo getaway just one week away, I’ve been trying very hard to cut down on the heavy snacks and indulging in super easy smoothies. I’ve made at least 10 different smoothie variations in the last 2 weeks but this raspberry mango smoothie has to be my absolute favorite. Plus, it’s so fun to look at! 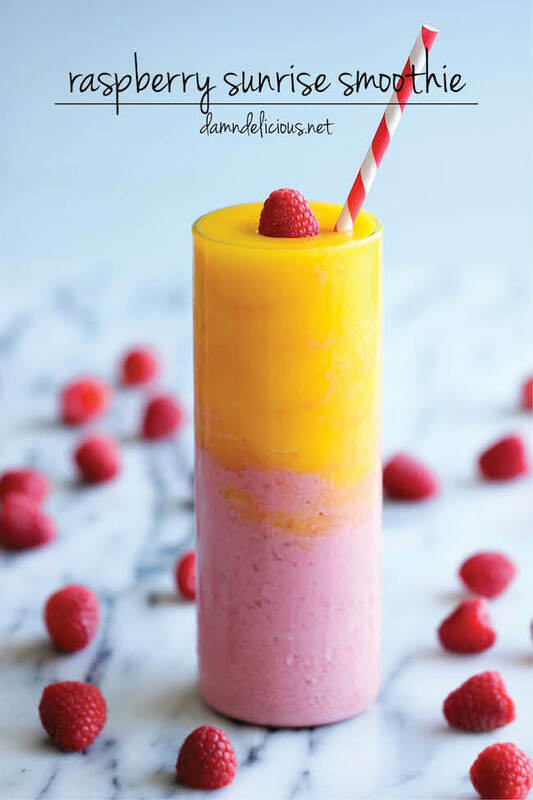 And the best part about this smoothie is that you only need 4 ingredients – raspberries, mango, milk and orange juice. That’s it! Now the raspberry portion doesn’t have a sweetener, but once you swirl in that sweet mango goodness, the balance of sweetness is absolute perfection. It’s not overly sweet but just enough to get your morning going. And if you’re not into smoothies for breakfast, these go perfectly as a post-workout drink or midnight snack. Midnight smoothies sound a bit unconventional but at least you’re cutting down on those midnight brownies and cookies. Or is that just me? Combine raspberries, milk and 1/2 cup ice in blender until smooth; set aside.